This month we're reviewing the history of our neighborhood surrounding the 2 Freeway in anticipation of the EIR for State Route 2 Glendale Freeway Terminus Improvement Project. 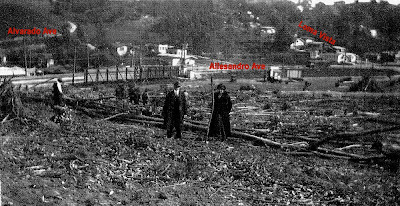 The Edendale and Glendale Red Car Trolley lines had a stop at Whitmore and Allesandro Ave. in 1923, mule teams cleared what was left of the forest around Lake View Ave. and Allesandro Way (see photos above). The area seemed to attract a number of religious sects. 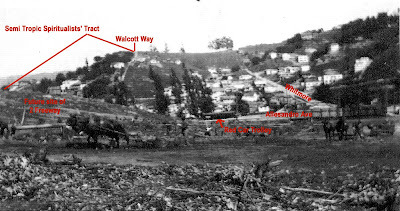 The Semi-Tropic Spiritualists incorporated in 1905 and subdivided the hillside (in the top photo) to sell the lots to their members. Fellowship Parkway, primarily a staircase street in Echo Park (just out of frame in both photos above) also seems to have been founded by a religious group. The Holyland Exhibition, founded by Antonio Futterer, still owns a number of lots on Lake View Ave., Silver Ridge Ave. and Allesandro Way. 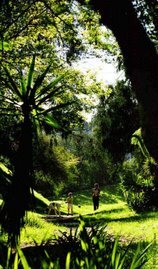 All of these groups placed a high value on the environment, planting trees and lush gardens that are still appreciated today.